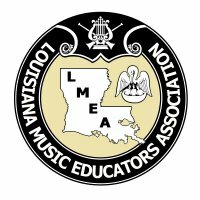 LMEA Connection is the Official Electronic Newsletter of the Louisiana Music Educators Association. In this newsletter you will find many links providing quick access to LMEA news, forms and useful information. Be sure to visit lmeamusic.org for additional information and announcements. On-Line Pre-Registration. You may still pay by check but now are also able to securely pay by credit card. Registering online will generate an email receipt with all of your registration information. Submit this receipt to your bookkeeper or boosters club or keep it for your tax records. If you have any difficulties with this process, email sharon.mcnamara-horne@stpsb.org. District Director Elections: Elections for members of the LMEA Board of Directors alternate years. This past spring (even-numbered years) you elected new division chairs and the president-elect. This next spring (odd-numbered years) you will elect District Directors in all districts. Your email or note must include: a statement indicating your willingness to serve as district director, your name, school where you currently teach (or “retired” if you are no longer teaching), district you belong to, email address, and phone number. If you are nominating someone include: a statement indicating that you have confirmed that person’s willingness to run, all of the previous information about them, as well as your name, email address, phone number, school where you teach (or “retired”), and your district number. Email this information to sharon.mcnamara-horne@stpsb.org, mail it to Sharon McNamara-Horne, Elections Committee Chair, 18449 Hosmer Mill Rd., Covington, LA 70435, or fill in and submit the online form (Resources -> Board of Directors – Job Descriptions and Form) by the deadline. See you at the professional development conference and All-State concerts! As a small state we enjoy an ever-growing annual professional development conference, a digital professional journal, a website and an e-newsletter. Yet LMEA’s greatest resource is its members. YOU are who we value. Your presence insures that we collectively attain our goals. All that LMEA offers to its members comes from its members, both the experienced and the novice innovators. LMEA maintains a forum that provides an open link for collaboration, an attitude of cooperation, and a channel of communication among all its educators. I encourage you to be involved as we evolve. Make the effort to stay informed, to contribute ideas and feedback, to volunteer (especially for assessments, for the conference, and for advocacy) to attend as many events as possible, and to make liberal use of our resources. When each member gives, we all gain. Will you be the face of leadership in our future? How can our magazine, our website, our e-newsletter enhance your daily endeavors in the classroom? What topics, needs or interests would you like to see presented in our conference clinics? What expertise or experience might you contribute to the members of LMEA? Together, the power of YOU becomes the power of US. Participate, Educate, Advocate. Beverly Stafford will be inducted into the LMEA Hall of Fame at 3:00 p.m. on November 19, 2016, in the main ballroom of the Baton Rouge Crowne Plaza Hotel. Mrs. Beverly Stafford was a music educator for 30 years. She taught at South Thibodaux Elementary School for 25 years earning superior concert ratings every year. She served as an officer in professional organizations throughout her career while also being active as a clinician and adjudicator throughout the state. Mrs. Stafford graduated from Assumption High School in 1953. She entered Southwestern Louisiana Institute (now the University of Louisiana at Lafayette) and earned her Bachelor of Music Education degree in 1958. While at SLI, she was a member of social sorority Alpha Sigma Alpha, and the music fraternity for women, Sigma Alpha Iota. Beverly was president of her SAI Chapter in 1955 and served as a delegate to the national convention in Washington, DC. Bobby Jack Thompson will be honored as the 2016 LMEA Outstanding School Administrator at 2:05 p.m. on November 21, 2016, in the main ballroom of the Baton Rouge Crowne Plaza Hotel. B. J. Thompson represents the best of Louisiana administrators. He possesses visionary philosophy that places a high priority on both academic achievement and student engagement in music and the arts. In the 19 year history of this award, Mr. Thompson is the first administrator to twice be selected as recipient. Erik Morales and Paul Frechou will be inducted to the Louisiana Association of Jazz Educators Hall of Fame at 3:35 p.m. on November 20, 2016, in the main ballroom of the Baton Rouge Crowne Plaza Hotel. The music of Erik Morales (born Dec. 10, 1966, New York City) has a unique melodic and harmonic vocabulary that appeals to audiences worldwide and has composed best-selling music for many types of genres including classical, jazz, commercial. His many published works encompass a large variety of styles and settings, including works for wind, orchestral, jazz and chamber ensembles and have been part of featured performances across the globe. Paul Frechou is currently the band director at Folsom Elementary and Junior High Schools. In the past, he has served as the Director of Athletic Bands at Southeastern Louisiana University in Hammond, Louisiana. He also served as Director of Bands at Mandeville High School in Mandeville, Louisiana. Under his direction, the Mandeville High School Jazz Ensemble performed at the Midwest International Band and Orchestra Clinic in 2005, held in Chicago.